Whether you are celebrating Christmas, Hanukkah, Ramadan, or any other special occasion (Festivus perhaps?! ), plants are always a great way to add warmth, cheer, and colour to your home decor. One of our favourites is the Lemon Cypress, also known as Goldcrest. We love it because of its cheery bright colour and fresh scent. These trees are native to the west coast of North America and thrive in temperate, moist climates. 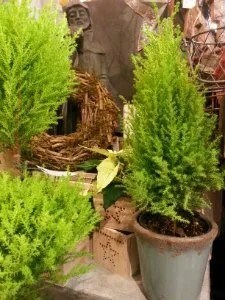 If you have a Cypress in your home it will appreciate being misted regularly, especially during our winter months. Poinsettias are a true classic. They have been a popular choice since they were first introduced to North America from South America in the mid 1800’s! The vibrant leaves are often confused with flower petals; however, the flowers are actually the small yellow part of the plant located in the center of each leaf bunch. 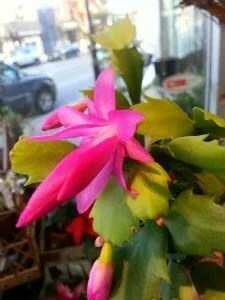 We also love the Christmas Cactus which is a small cacti native to Brasil. They are quite different from desert cacti as they grow in shadier locations on trees or between rocks. The flowers can range in colour from white to pink, red, yellow, orange and purple. Come into the store to see these beautiful seasonal plants and many more. See you soon! Don’t Miss our Holiday Wreath Making Workshop this Thursday, Dec 4th at the Cupcake Lounge! INFO HERE!